If you are growing Crocus nudiflorus, or any crocus, now is the time to look for the seed pods as the petiole extends and pushes them above the ground. I know I keep saying it but: seed is the best way to increase your bulbs and also ensure that you retain as wide a genetic population as possible. 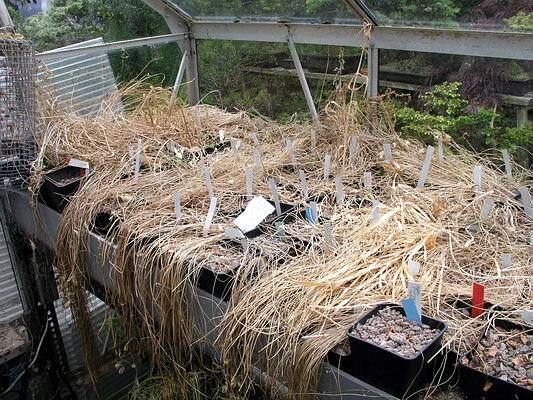 Either store your seed in packets covered with a little dry sand, to be sown in September, or you could sow them now 5 to 7cms deep into dry compost and keep the pots under glass so they stay dry until the autumn storm; the first watering in September. Do not forget to take a close look at the seed use a magnifying glass or better still take a picture with your digital camera then you can view it super close on your computer monitor. 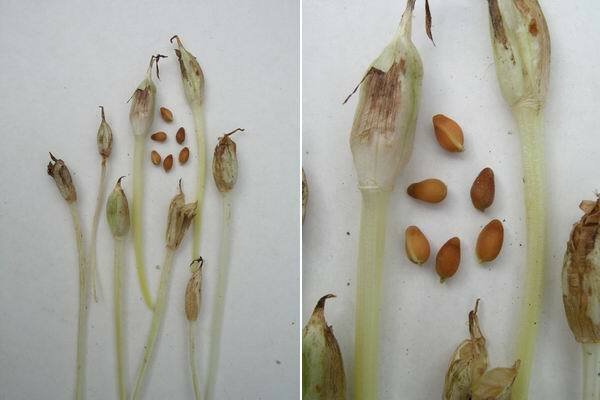 They are all different, here I show seed of Crocus nudiflorus on the left and and C. vernus on the right. I have also started to repot some pots of seedling crocus - this cluster of Crocus vallicola seedlings is being repotted for the first time. 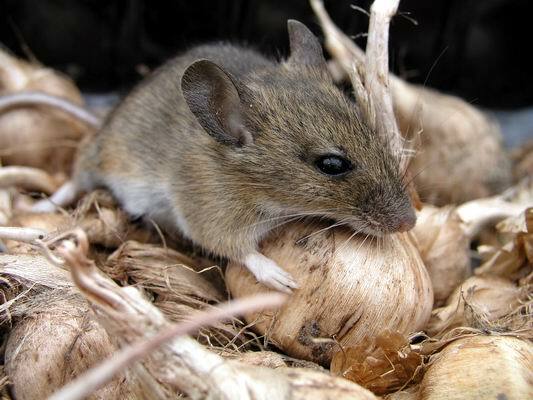 Clean off the dried remains of leaves and roots; I do this by gently rolling the corms between the palms of my hands letting the cormlets roll out into a saucer which leaves me with a handful of rolled up leaf and root remains. Now I repot them into fresh dry compost taking care to plant them back to the depth that they were at and certainly not any nearer the surface; this pot will also be kept dry until September. I am interested to note the number of small corms in this pot. Are these seedlings that did not germinate the first year or are they offsets? 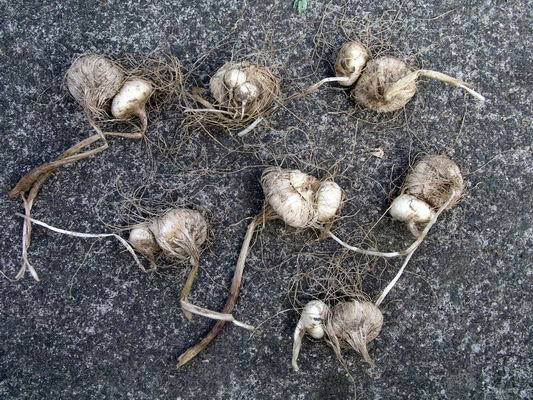 I have never found Crocus vallicola setting many bulbils for us when grown in the open frames so, if these are offset bulbils, is their appearance due to the corms being kept hot and dry rather than cool and moist - I will have to experiment to find the answer. 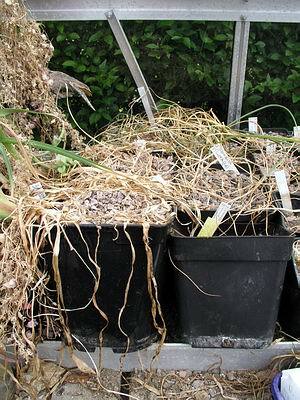 Also up for early repotting are our Techophilaeas - they have pale corms similar in shape to crocuses. 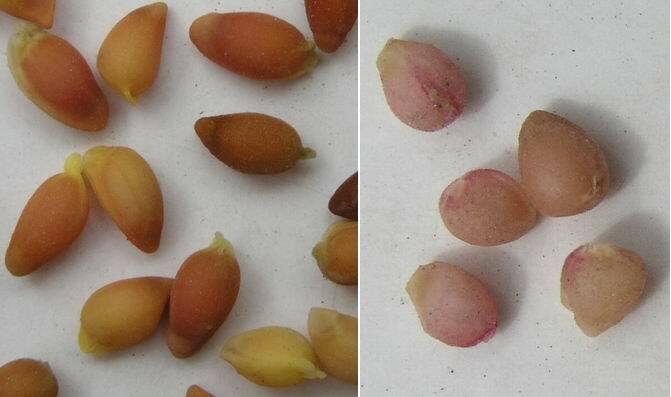 When growing well they will each produce a second corm slightly smaller than the dominant corm but still of flowering size. Sometimes we have had up to three offsets plus the dominant giving us a good increase. I put a reasonable number of corms back into a pot leaving us with about the same number for surplus. 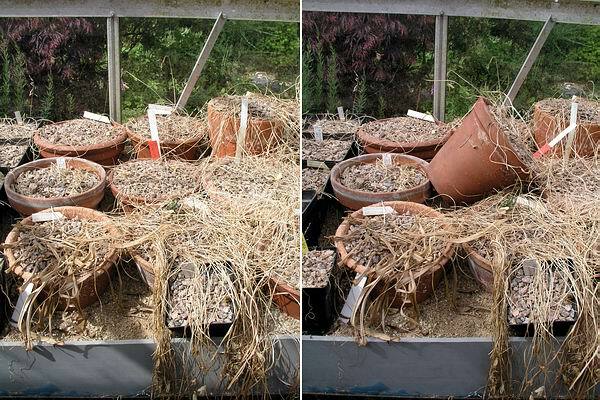 Following on from last week's log where I said the ideal would be to repot everything the day before I give the first watering in September, I will look at ways to compromise and how best to store your bulbs for their summer dormancy. 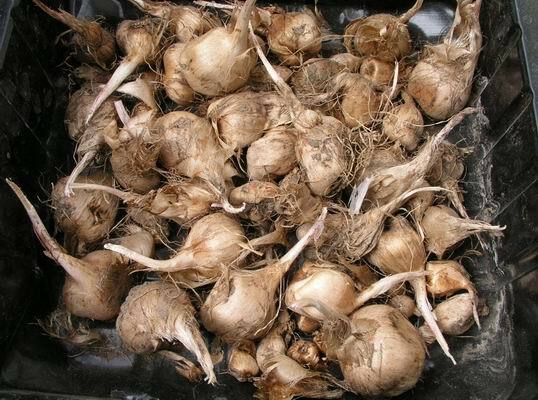 Crocus sativus corms have a thick multi layered tunic that helps prevent them from drying out too much and that is why they can survive being displayed in garden centres for long periods with little harm coming to them but I would not recommend this treatment for any bulbs. Others may take an interest in your crocus but not for the flowers. mpromise and start repotting now. Most bulbs get sufficient heat, even in Aberdeen, to form the buds but I have found that a few such as Narcissus romieuxii and Sternbergias need that wee bit more heat. I arrange this by lifting the pot out of the plunge and laying it at an angle with the side facing south so it can absorb some extra warmth. This technique also works for clay pots. If you live farther south, in the warmer areas, you may not have to do this as you will experience much higher temperatures in your glass houses. The black plastic pots absorb heat more efficiently than clay ones do, especially when the sides are exposed to sun shine and many of the Sternbergias are flowering much better since I have grown them in square plastic pots. During the summer your bulbs want some warmth but try not to expose them to conditions that will force them to start to lose moisture. They have evolved to cope with this extreme of hot arid conditions when they will lose some of their stored moisture but it is much better if we can help them to preserve this store by preventing them overheating. Not a problem in North Scotland but in hotter areas a covering of newspaper over the pots will help shade and reduce excessive moisture loss. 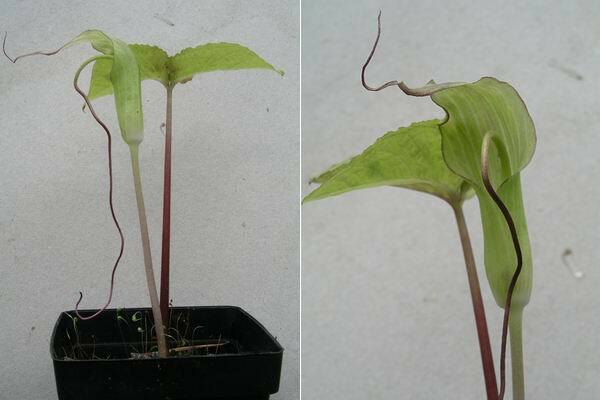 A very nice dwarf Arisaema sp. for which I have lost the label. I have ordered the revised edition of the book on Arisaema due out in August so that I may be able to put some names on the many Arisaemas we grow. 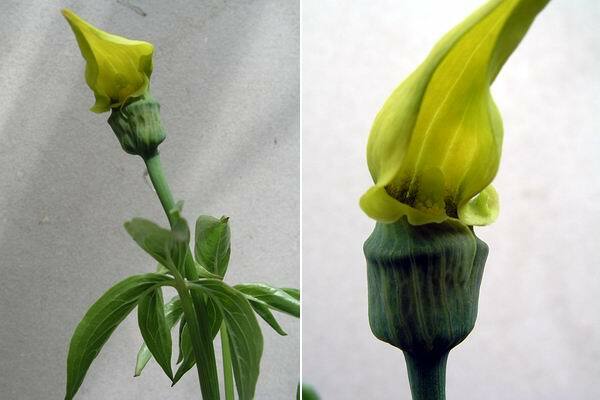 I do know that this one is Arisaema flavum, very distinctive with its small intensely yellow flowers.